I'm a Firestormer, twisted Firestormer. 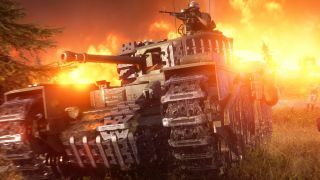 Battlefield 5's battle royale mode, Firestorm, is now live, and while we can't help you choose from the veritable bevy of battle royales currently up for grabs we can fill you in on what we know, so far, about DICE and and Criterion Games' spin on the hugely popular shooter genre. We've already spent some time with Firestorm and can confirm it makes for some pretty intense encounters, not least because of the size of the map and the huge array of weapons and vehicles up for grabs… if you're lucky enough to yoink them first, of course. While we knew last year that a Battlefield-flavored royale was in the works, DICE took the surprising decision to launch Battlefield 5 on time but hold back the BR mode until it was good and ready. For more, head on over to our handy Firestorm hub and/or check out our Battlefield 5 review.